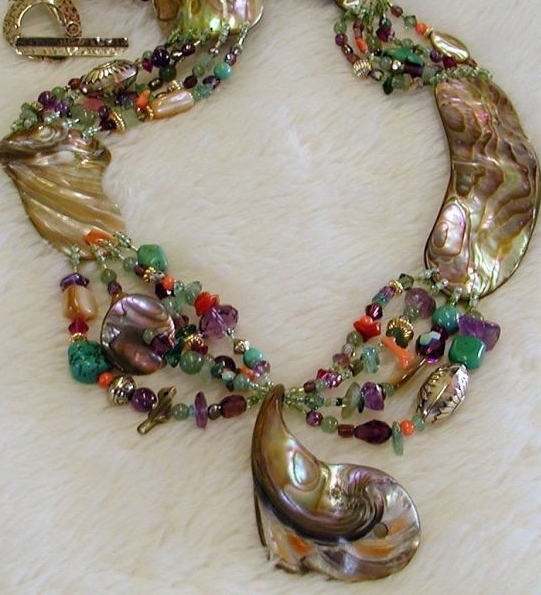 We design and create rare abalone jewelry. Our jewelry was exhibited in our National Art Museum in Washington, D.C.
We began our abalone adventure in 1984 searching the rugged “Lost Coast” of Northern California for fragments of rare red abalone that washed ashore. Our handcrafted jewelry collection was discovered by The Smithsonian Institution and featured at The National Museum of American Art in Washington, D.C. We give the glory to our Lord and Savior Jesus Christ. In prior generations native Americans used abalone for healing, strength and protection. It was also used in exchange for goods and services. Today the wild red abalone is nearly extinct. Our abalone jewelry was exhibited in The Renwick Gallery which is located steps from the White House in the heart of historic federal Washington. It became the home of the Smithsonian American Art Museum's craft and decorative arts program in 1972 and features one of the finest collections of American craft in the United States. I had been a homeless minister on the streets of LA and other parts of California in the 1980's. This was a far cry from a law career in NYC that God slowly removed me from after I had achieved some modest success. How was I to know LAW was a training ground before His Grace got a hold of me! And so was the music career I had established at night in the Cabaret. Living by His grace through faith God blessed me with pieces of abalone shells I found on beaches of N. California where I was ministering to the homeless. I had no idea that this creature existed until I stumbled upon a piece of shell on the beach one day. Six years later, after collecting countless pieces, Jackie and I met, and began working together to make jewelry. She is quite a talented designer who is self taught like me. At this time I had no money to speak of but A LOT OF ABALONE! and by faith she and I set out to make jewelry having not a clue what we could do with it. We know abalone and are certain its gem quality is very valuable. You will see that our collection of wild red, green and black abalone has no equal in the world. No one has explored the coastal areas of the western hemisphere like we have salvaging from extinction rare abalone pieces and a most valuable artifact of the 20th Century. After 29 years of experience with abalone we can guarantee it. Two NHK (Japan's public broadcasting corporation) reporters came to see us and made a video report for Japanese TV of us creating abalone jewelry and also featured local history of abalone and the Chumash Indians.